Movienizer can download information about movies and actors from various online movie databases. There are several databases available in English, you can also switch to a database in different language. Downloaded information (type, amount, etc.) is mostly controlled by the "Download options" tab of the "Options" window. However, every download script may offer additional settings that customize its behavior. This article describes available options for the IMDB script (movies). 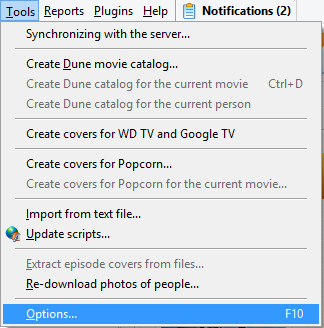 Make sure that the "imdb (Multiple)" script is selected (it should be highlighted in the list and also selected in the dropdown list above the list area). Click the "Settings" button. Override global download options. You can enable this option to disregard settings of the "Download options" tab, if they conflict with your settings in this window. For example, you can choose to download information about seasons and episodes of TV series on the "Download option" tab but disable downloading this information in the settings window of the IMDB script. If the "Override global download options" box is checked, no information about episodes will be downloaded, otherwise such information will be downloaded even though you disable this in the script settings. In the "Search" area, you can adjust how Movienizer searches for movies at IMDB. Search by AKA (also known as) titles - enables searching for movies not only by their IMDb titles, but also by any variants of the title that a movie may have. This includes translated titles. So, using this option, you can enter not only the international title of a movie, but also its title used in your country (if other than US or UK). Alternative search - enables using a different search string, which may help in certain situations. You can try enabling and disabling this option to find out what works better for you. Show adult titles. IMDb does not display any adult titles in its search results, unless you log in to the service. You need to be registered at IMDb in order to use this option. After you enable it, you will be prompted to enter your login and password data next time you look up a movie. The login and password data is sent using a secure connection. If you have any problem downloading information about a group of movies at once, disable this option. The "Main data" area allows to enable or disable downloading various items. If the "Override global download options" box is checked, only selected items will be downloaded. Otherwise you may need to review the "Download options" tab. You can see that "Title" is also an option here. This requires a special comment. If you download information about a movie for the first time, its title will be downloaded anyway. It is not possible to have a movie without a title in Movienizer. But you can change the title later. Disabling the "Title" option will allow you to keep the changed title if you decide to update information about the movie by re-downloading details. The "Pictures" area contains some options for downloaded images. Limit resolution of downloaded pictures. This limits resolution of all images that you download to the specified width and height. Images are resized proportionally, which means that the resulting images will in most cases have resolution other than 800 * 600 (taking the values from the screenshot). However, width of such image will not exceed 800 and height will not exceed 600 pixels. Download movie posters from themoviedb.org. Movienizer can additionally look up and download high-resolution posters from themoviedb.org. This does not work for TV series. Download movie backdrops from themoviedb.org. The same as above for backdrops. Download posters for TV series from thetvdb.com. Enable this if you want to download high-resolution posters for TV series from thetvdb.com. This does not work for usual movies. Download backdrops for TV series from thetvdb.com. The same as above for backdrops. You should take into account that downloading pictures from themoviedb.org and from thetvdb.com is an additional option. The program looks up such images automatically, which means that there may be errors (pictures for a wrong movie or TV series downloaded). If this happens, disable the options. The "Language" area offers a couple of language-related options. IMDb in your language. This option was discontinued by IMDb and has little effect now. However, the program does take it into account when downloading such information as descriptions of TV episodes from thetvdb.com (see later). Title language. You can download titles that are used in your country instead of international titles. For example, enter "Italy" to download Italian titles, "France" for downloading French titles, etc.